You can't blame Alan Judge for walking around the Ireland camp with a huge smile on his face these days. 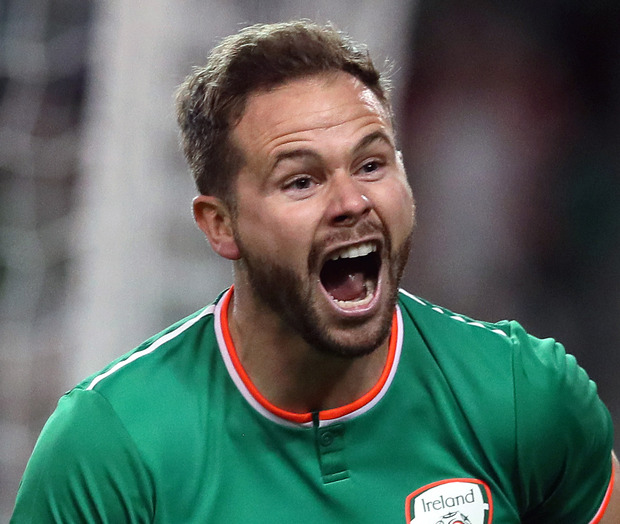 Playing against Gibraltar tomorrow or Georgia next Tuesday in Dublin would be the icing on the cake for the 30-year-old midfielder after two lost years in the prime of his career. Judge was playing career-best football for Brentford in April 2016 when he suffered multiple breaks in his left leg in a challenge in a Championship match against Ipswich Town. At the time, such was his form, Judge was touted as a potential 'bolter' for Ireland's Euro 2016 squad. But the injury put an end to all that and led to more than 18 months out of the game and another six months of feeling his way back into action. He candidly admits that long spell of recovery and rehab was hard on him personally as well as professionally. "There were times when I was injured and coming home just trying to put on a happy face for the kids," remembers Judge. "There'd be times if I didn't have a great day at training I'd be coming home and I'd just stop off in the car about 200 yards down the road from the house to have 10 minutes to myself because I never wanted to bring that home to the kids. "I didn't want them to see that, I didn't want them to see that I was annoyed or upset because of what had happened in training. "Luckily enough, I didn't actually have too many of those days; but there were days I did have them." And Judge has been brave too, brave to fight on through the long road to get back to full fitness and to be scrapping for a place in the Ireland team. "People were saying to me: 'you must be incredibly strong'. "But it didn't bother me. The minute I got back on to that pitch was all that mattered to me. "People could see when I got back that it didn't bother me, I was going into tackles and everything. "I'm now the fittest I've been for a long time," Judge continues. "I just needed games. I've gone out and got them and my sharpness got better with every game." That phrase 'I've gone out and got them' refers to his move from Brentford to Ipswich in January. "I'm enjoying my football there, even though we are bottom of the Championship," the Dubliner adds. "In my time out with Brentford the team had moved on. "That's it, things move on. I'm not going to expect a team to wait for me for two years."